Today the weather is due to break. The humidity should drop. In theory, at least, that will make a dent in the population of mosquitoes tormenting us. Until then, I'll continue to smash them on the window glass. 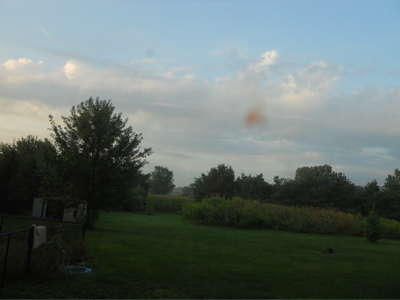 You see the remains of one, probably my blood, on the photo above, shot through the sliding glass door. At the moment I love smashed mosquito remains. The running joke here is that the mosquito is the state bird of Texas. You're not alone. May you get through this unscathed.